Social and digital media have driven many brands to try their hand at co-creating products and services with consumers and customers. A major financial services client has set up a community of young adults to get their input for a new offering. Ford (cl) has a "your ideas" feature that collects suggestions from the crowd. Intel (cl) maintains a group of advisers known as the Intel Insiders who constantly offer input to the company specifically about social media, digital and how it impacts marketing and product use. These particular examples show brands with a decent commitment to listening and soliciting thinking from customers in a new way. Too many brands look at co-creating either as a gimmick, something to try once or twice, or as a fancy name for the type of research they have always done (i.e. focus groups) to ensure an investment in a product or service (or marketing campaign) will have its desired effect. What is the difference between focus groups (qualitative research) and co-creation? Both solicit the opinions of customers. The image of focus groups includes one-way glass, moderators, and bowls of M&Ms in the client viewing gallery. Reports are written and summarized. 2-page executive summaries get circulated inside the company. Co-creation is more direct. It brings customers into a more collaborative process with actual product managers. The intention is not simply to learn what they want. It is to have their POV help make a better, more useful product. It's less about discovering one or two useful insights (although insights abound in co-creation), than building products based upon fundamental input from those who use the service. 1. Collaboration sessions: even the image that accompanies the article - 3 interns sitting around a company conference room, laptops open and talking to a Plum Willow product person. This is not your usual focus group interaction. It is more collaborative. 2. Commitment: they may not have walked into the process knowing that they would make co-creation a part fo their product/service development but thats what it became. ...Nearly 20 girls have cycled through the company since early this year, PlumWillow says." 3. Strategy to Remain Agile: "Agility" is clearly a term borrowed from physical characteristics denoting speed, responsiveness and the muscles and instincts to support that speed. The term has since been applied to a type of software development that is quicker and less burdened by unnecessary process. Now we are applying it to business and marketing. Many companies make a fatal error in interpreting what it takes to be agile. They see it as a more heuristic approach and therefore more based upon smart "hunches" and instinct. That seems to exclude customer input. Not so. What agility really calls for is institutionalizing customer input so well that it becomes an accepted and efficient part of the process. PlumWillow puts it this way, "They (interns) help keep the company nimble enough to catch and fix mistakes before they are pushed out to broader audiences, executives say..."
Does ROI Get in the Way? I had a great conversation with Judy Walklet from Communispace when I spoke at CTAM last week. We talked about the challenges of reporting the business value (ROI) of their great communities. Their whole business is about helping organizations maintain a direct channel with a group of customers and constantly learn from that exchange. The value in higher adoption of relevant services and "failure-avoidance" may be intuitively clear yet it remains hard to measure for ROI purposes. The benefits of this type of co-creation are woven into better products, faster development times, fewer false starts or bad product implementations. How do you measure this complexity? While it can be done, I would argue that if business wants to embrace a more agile product development process, today they need leadership within their company to make it the priority even while the ROI dashboard struggles to fully report the impact. Extends beyond the campaign: the video call to action to get folks to engage was posted on their Facebook page in September 2009. The entry period ended in late October. That is a classic 6-8 week "contest" cycle and is what many CPGs (or FMCGS - fast moving consumer goods) use as a best-practice time period fo focusing peoples attention. In November they announced the flavor and that they were down ot 3 recipes. This past week they revealed the winners, and the package design (complete with a blue Facebook logo-more on that in a minute) and the product hits shelves in March 2010 undoubtedly with much fanfare and paid media support. Glaceau has gone byond the standard campaign cycle of engagement and created many moments over at least 6 months to keep folks engaged. The co-creation has spawned a new product which I presume they have tested in ways they always do to feel re-assured that it has potential in the marketplace. Use Facebook as their platform: like McDonalds, iTunes, VSPink and some other brands, Glaceau is committed to Facebook and more importantly to their 1.1m fans (aka customers). They routinely offer them interesting offers and opportunties. And they try to be humans in the way they speak. They did at least two other "activities" over a similar period both tied to celebrity or entertainment brands: Twilight New Moon and 50 Cent. That must have helped them with overall awareness tremendously as both have active fan communities within Facebook. The kicker? They have made the new flavor, Connect - complete with the Facebook logo, into the profile image of the page. What a terrific reminder to everyone that they are embedded in the Facebook world. And a great example of extending the Facebook partnership beyond the media buy for the year. "The app itself doesn’t exactly give you the ability to mix flavors together to create your own, but instead lets you monitor social media buzz on the top 10 flavors in contention. It pulls in social chatter from Google News, Twitter, Flickr, and Foodgawker, which means that your tweets, blog posts, searches, and images could all help nominate a flavor for consideration. The more chatter on a flavor, the more likely it will make their final top 10 list. Once the social buzz has been tabulated, app users will be able to vote on their favorite flavor, starting September 14th. The most interesting aspect of the app and social media marketing campaign, however, is the bottle design. Starting on October 5th, you’ll have the opportunity to use the app to design the entire label. This includes look and feel, your own spin on the flavor blurb (ever notice how funky the flavor blurbs are? ), and the be all end all flavor factor — the name. You can work in teams with up to two additional Facebook friends, and the winner will be decided by Vitamin Water and their celebrity partners." What I don't know and would love to is how many votes were cast and if that was in anyway statistically relevant and decisive in the selection. The ultimate winner was chosen by the brand. Presuming they did their own flavor focus group testing, it would be interesting to see how consistent the Facebook data was to whatever qualitative testing they did. They are supporting a new product in the marketplace that their Facebook fans developed. That si the story. Many co-creation ideas fizzle when the brand reveals they are not willing to follow through with what the community points them to or do it in a half-assed way. It will be interesting to follow the rest of the story - how the product fairs and how Glaceau puts a value on their rigorous use of Facebook engagement. Mindstorms Big Robot on Campus, the NetFlix Prize, The Electrolux Design Challenge - these are all classic high-profile examples of open innovation challenges or forums that invite "outsiders" in to innovate with companies. This is different than promoting an open-source marketplace like Linux or iPhone application development. These historic examples are not about tapping into a scalable marketplace of innovation (see Nesta's P&G Corporate Open Innovation Challenge as an example), they are about making their internal teams more creative, more productively innovative, and about investing in a culture of innovation (and, therefore, sustainable growth and defensible marketplace advantage). Hard to justify with quarterly earnings releases. But that is why purposeful business culture is hard and requires leadership. and, of course, the main "hard" business impact that most comapnies claim is the true outcome: talent recruitment. While this last point is key, it pales in comparison to the first few benefits which are all about cultivating a culture that leads to more innovation. Ford's "American Journey 2.0” (disc:client) - a challenge with the University of Michigan students to develop applications comaptible the Ford/Microsoft Sync platform. “Already with SYNC, we have proven that we can access information in the ‘cloud.’ This research gives us the opportunity to harness the power of student innovation to explore beyond those capabilities and develop what’s next,” said Venkatesh Prasad, group and technical leader of Ford’s Infotronics team in Research & Advanced Engineering. VTech's partnership with Savannah College of Art and Design (SCAD) (disc: Vtech is a client of our company) - their program, Cultural Context of Design, puts industrial design students into Vtech to experience the full monty of how coporate culture affects design. They experience teh discipline of the business problem. One might argue that this sounds more like an internship program than open innovation. I disagree. The integration of design students with a fresh POV into the enterprise does inject innovation into the organization. Just looking at the images of prototypes in this month's Metropolis Magazine (not yet on their Web site, hmmm) makes that much clear. HP Labs’ Web Services and Systems Lab (WSSL)support of the Open Publishing Lab at the Rochester Institute of Technology - the Open Publishing Lab explores the future of "publishing" and while their mission is a little squishy to me (and interestingly they exist in RIT's School of Print Media), HP's support may fall in this category of open innovation if they socialize what the RIT team learns and comes up with at HP. If this is a token gesture with one HP person attending next May's ImagineRIT Festival, then they may not reap the true innovation injection possible. Can the business impact be measured? What's great about each of these examples is not the embrace of some simplistic consumer-driven innovation (nothing wrong with that but it serves another purpose). Companies are identifying people who are especially smart about the challenges they face but are well outside the usual talent base of the company usually because they are students or represent a discipline that may be under-represented in a company (like designers!). In the best cases, the experience is highly visible within the organization and there is lots of interaction between outsiders and insiders. I plan on setting up our own challenge as I see a tremendous application with the world of social media marketing and communications and social business. Yet how can I make the had-number bsiness case to a publicly traded company? Does the commitment for such a program rest solely on some qualitative impact to culture and business that a CEO either embraces or not? Can you attribute improved business perfomance to a well-integrated innovation project? 1. Check out Wordle.net's view of the President's Inauguration speech (first time I wrote, "the President" meaning President Obama). Great visual way to form a text cloud. 2. Check out the new Whitehouse Web site. It just launched complete with a blog, a Contact Us page and a call to "participate" from the Office of Public Liason. A great bridge between "brand Obama" as expressed in the campaign and, later, Change.gov, and the official Presidency. 3. Check out CNN's "the Moment" in a day or so. Using Microsoft's Photosynth and everyone's pictures snapped at 12:00 PM (or whenever the new presdient actually took oath), CNN will stitch together a crowdsourced photo experience. This takes the "Day in the LIfe..." photo projects to a new level. Today's concert at the Lincoln Memorial was moving. President elect Obama's speech inspiring. I watched it on a free glimpse of HBO (since revoked back to paying subscribers only). The excitement is rising. I attended a friend's party last night filled with out of town revelers who are planning to attend the frigid swearing in and a few Inauguration Balls to top it off. The energy at the party was high. At the Ward 4 house in Shepherd Park, they played Dr. King's "I Have a Dream Speech" on a loop into the street to greet all of us who came. The party went till 4am and the police came when they forgot to turn "off" Dr. King. 1. Use the hashtag #inaug09 on all of your tweets. I am certian that there will be others. This one comes from Kenneth Yeung who gives credit back to NPR's Andy Carvin (in our fair city). 3. You can jump in with CNN via their Facebook partnership. It will lead you to an "event page" within Facebook which is essentially a promotion for the live coverage site found here. Sounds like they are planning on displaying the Facebook news feed (user's updates) adjacent to the video stream. Not sure this adds up to more than a "subscribe" outpost in Facebook but we'll. After all, CNN got an awesome write up for their digital leadership in news via the Sunday NYTimes today. Download the iPhone app from the social networking section of the iPhone app store. For the Google phone, go to the Android Market and search for "IR09." Send a text message to 66937. Begin the message with the phrase #inaug09 or #dctrip09. You can include a ZIP code or one of the location tags in the sidebar. You can follow along in their aggregate feed widget located here. Not sure how to download or embed it which is strange since it is formatted to look like an embeddable widget. 5. You can follow PBS's NewsHour Twitter updates here. While not strickly social, they also have a handy inauguration map here. 6. Or you can simply follow Obamathon Man's blog where he promises to attend and cover the Inauguration so you don't have to. photo: thanks to earmuffboy of Flickr and his groovy CC license. We Are All Fashion Designers Now! Now there are two resources - one online and one in Beverly Hills - that tap into the personal stylist in all of us. "Street" is probably the wrong word. Personal Style is probably a better phrase overall but still we are talking about everyday fashion made for and by the people. 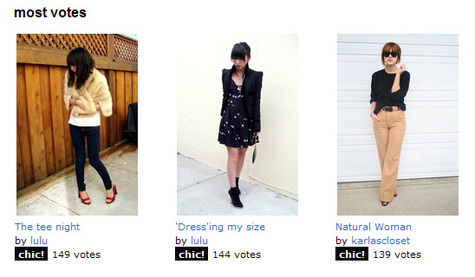 I love Chictopia. The name comes from "chic" not "chick" so, don't worry. Helen Zhu and her cofounders have established a social network grounded in people sharing their looks for themselves and getting ideas from the community. you can dive deep into the forums but the real action is in the photographs and the voting. This simplicity is the core of its beauty. In a time when we all belong to too many social networks, a simple structure that builds on teh one affinity - personal fashion - that brings members together is better than all the bells and whistles in the world. Did I mention Hot Deals! Chictopia has a great business model that goes beyond targeted display advertising into deal sponsorships. If I were a retailer serving young women, i would be all over this community. (Sure, they don't have real "reach" yet, but I love this idea so much I knwo they will get there). "Using touch-screen Design Pads, they begin by selecting what type of garment they'd like to create, choosing from an assortment of tops, bottoms and dresses. From there they select a fashion "mood" onscreen—themes include Juku, Pop, Rock, Malibu and Peace, all of which include a colourful array of graphic images. They then pick embellishments for their garments, choosing from options including Sew It, Clip It, Bling It and Pin It. Once a girl completes her design, she proceeds to the U-Bar, where a friendly Fashionologist uses a heat press to add the key design element to her new look and gives her a tray of embellishments to take to the customized Make It table. " I am going to LA in a few weeks and hope to stop into the store to get some pics. For teh tween who wants a distinctive look - something that defines her - this could be a great choice. The looks have to be "ownable." It cannot just be the difference between a glitter butterfly vs. an applique puppy. I serached Flickr and came up empty. But that is what they need - a gallery of customers proud in their looks (tough when your customers are so young and online privacy is a concern). Can they create a Chictopia-lite community? Will they offer looks as dramatic as the streets fo Japan? Whil ethe seocnd isn't likely, i hope they figure out the online gallery. Their store begs for user images. I love how digital is putting the consumer in charge of fashion.